Dr. Pancho’s declaration: "I separate myself unto You Father to do You will, even unto death"
TAKE TIME TODAY TO BE HOLY. The word holy does not mean goody- goody; it means set apart for sacred use. That is what these quiet moments in God’s Presence are accomplishing within you. As you focus your mind and heart on Jesus, you are being transformed: re- created into the one He designed you to be. This process requires moments of time set aside for communion with Him. As we begin to thank God today, let us start by thanking Him for His presence and for the peace that comes from Him being present in our lives. His presence and His peace are gifts of supernatural proportions. Ever since the resurrection, Jesus has comforted His followers with these messages: and I am with you always and "Peace be with you." Listen as Jesus offers you His Peace and Presence in full measure. The best way to receive these glorious gifts is to thank Jesus for them. It is impossible to spend too much time thanking and praising Him. We were created first and foremost to glorify God. Thanksgiving and praise put you in proper relationship with God, opening the way for His riches to flow into you. As you thank God for His Presence and Peace, you appropriate His richest gifts. For a THANKFUL ATTITUDE opens the windows of heaven, and Spiritual blessings fall freely onto you through those openings into eternity. Thankfulness is not some sort of magic formula; it is the language of Love, which enables you to communicate intimately with God. A thankful mind- set does not entail a denial of reality with its excessiveness of problems. Instead, it rejoices in Jesus your Savior, in the midst of trials and tribulations. God is our Refuge and Strength [mighty and impenetrable to temptation], a very present and well- proved help in trouble. He did say, I am your refuge and strength, an ever- present and well- proved help in trouble. AS YOU SIT QUIETLY IN HIS PRESENCE, God will fill your heart and mind with thankfulness. This is the most direct way to achieve a thankful position in coming to the knowledge that He is your God. Your mind needs to be focused, you need to achieve a state of maximum distinctness and clarity of God's Love poured out for you on the cross. Remember that nothing in heaven or on earth can separate you from that Love. This remembrance builds a foundation of gratitude in you, a foundation that circumstances cannot shake. Have you even begun to understand what kind of power that you’ve been given? This Word that is from God, is in its essence, is more powerful than any nuclear energy we have come to know about. Now that’s what I call power. As you go through this day, look for tiny treasures that God has strategically placed along the way. He has lovingly gone before you and planted little pleasures to brighten your day. Look carefully for them, and pluck them one by one, and when you reach the end of the day, you will have gathered a lovely bouquet. Offer it up to God with a grateful heart. And receive His Peace with thankful thoughts when you lie down to sleep. Thankfulness takes the sting out of adversity. That is why I have instructed you to give thanks for everything. 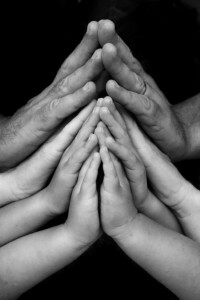 ... always giving thanks to God the Father for everything, in the name of our Lord Jesus Christ. There is an element of mystery in this transaction: You give God thanks (regardless of your feelings), and He gives you Joy (regardless of your circumstances). This is a spiritual act of obedience—at times, a blind obedience. To people that do not know God intimately, it can seem irrational and even impossible to thank Him for heartrending hardships. Nonetheless, those who obey God in this way are invariably blessed, even though difficulties may remain. Thankfulness opens your heart to His Presence and your mind to His thoughts. At times, you must think before you think. You may still be in the same place, with the same set of circumstances, but it is as if a light has been switched on, enabling you to see from God's perspective. For it is this Light of God's Presence that removes the sting from adversity. Begin to thank God FREQUENTLY as you journey through today. This practice makes it possible to pray without ceasing, as the apostle Paul taught. If you are serious about learning to pray continually, the best approach is to thank God in every situation. These thankful prayers provide a solid foundation on which you can build all your other prayers. Moreover, a grateful attitude makes it easier for you to communicate with Him. When your mind is occupied with thanking God, you have no time for worrying or complaining. If you practice thankfulness consistently, negative thought patterns will gradually grow weaker and weaker. Draw near to God with a grateful heart, and His Presence will fill you with Joy and Peace. Rejoice evermore. Pray without ceasing. In everything give thanks: for this is the will of God in Christ Jesus concerning you. Romans 15:13 now the God of hope fill you with all joy and peace as you trust in him, so that you may overflow with hope by the power of the Holy Spirit. This is the day that God has made!! As you rejoice in this day of life, it will yield up to you precious gifts and beneficial training. Walk with God along the high road of thanksgiving, and you will find all the delights He has made ready for you. To protect your thankfulness, you must remember that you reside in a fallen world, where blessings and sorrows intermingle freely. But do not place your focus on adversity. A constant focus on adversity defeats many Christians. They walk through a day that is brimming with beauty and brightness, seeing only the least of their thoughts. Neglecting the practice of giving thanks will darkened your minds. How precious are the children of God who remember to thank Him at all times. For they can walk through the darkest days with Joy in their hearts because they know that the Light of His Presence is still shining on them. Rejoice in this day that God has made, for He is your steadfast Companion.